Each of our 58 guest rooms feature pops of sunny yellow and natural elements. The spacious rooms include luxurious king or queen beds, armoires, mini-fridges, and deluxe bathrooms. Geometric and mid-century modern furnishings keep things interesting. Local art and throw pillows round out the rooms. The king guest rooms are ideal for up to two guests. 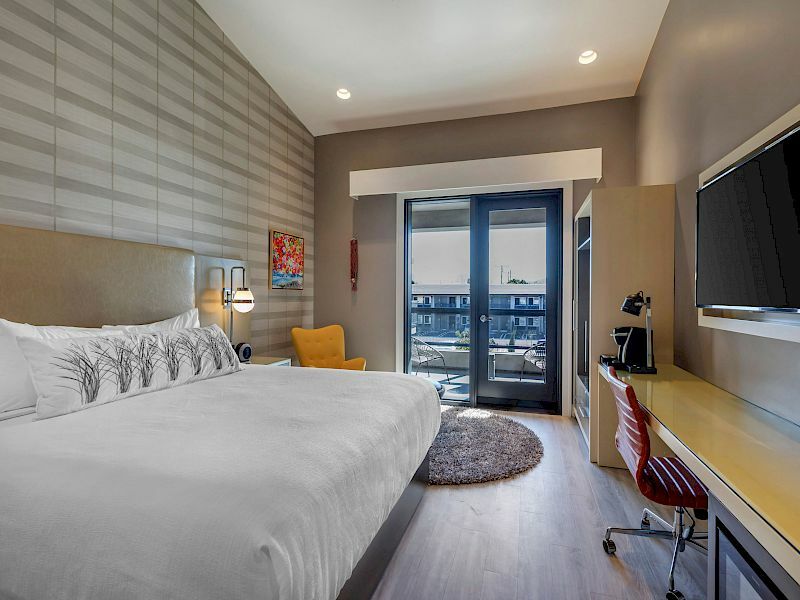 Each room features a modern king bed, plush linens, chaise lounge and coffee table, desk and chair, wall-mounted TV, mini-fridge, coffee maker, and bathroom complete with curated amenities. The two queen guest rooms are ideal for up to four guests. Each room features two modern queen beds, plush linens, chaise lounge and coffee table, desk and chair, wall-mounted TV, mini-fridge, coffee maker, and bathroom complete with curated amenities. The spacious executive king guest rooms provide an upgraded hotel experience. With ample space to relax and unwind, each room features a modern king bed, plush linens, wet bar, balcony, chaise lounge and coffee table, desk and chair, wall-mounted TV, mini-fridge, coffee maker, and bathroom complete with curated amenities.